GTA's new five-storey building sits on 150,000 square feet (14,000 square metres). Luxury auto dealer Grand Touring Automobiles (GTA) has opened a five-storey location in downtown Toronto to showcase seven high-end brands, all with separate showrooms. In late 2017, GTA moved from its previous location in midtown Toronto, where it was renting property, to land it purchased. There, it built a five-storey building on 150,000 square feet (14,000 square metres). GTA has been growing since Paul Cummings purchased the company in 2009. The downtown location will be GTA's marquee, selling Jaguar Land Rover, Lamborghini, Bentley, RollsRoyce, Bugatti and Aston Martin vehicles. Each manufacturer has its own showroom decorated in its own corporate identity. 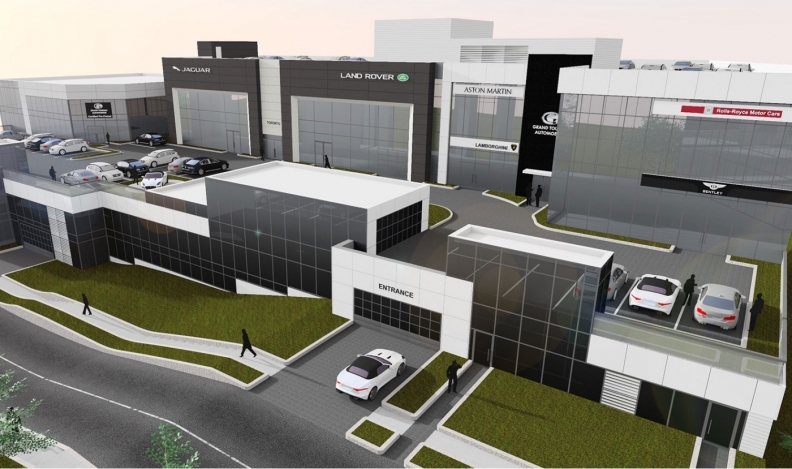 GTA's new location, built on a sloping floodplain, is five times the size of its previous location, which became outdated when GTA began expanding in tandem with the rise of the luxury/super luxury automobile market. GTA has a second store in north Toronto, where it sells Lamborghini, Aston Martin and Karma. GTA COO Mark LeRoeye said the building is striking both from the interior and the exterior, providing a picturesque view of the Toronto skyline. The designer is Toronto-based Plaston Architect. GTA broke ground on the new property in September 2015 with a cantilever design that features a portion of the building jutting out horizontally toward the Don Valley Parkway. The parkway is a 15-kilometre highway connecting traffic from the south end of the city by the waterfront to the north end, connecting with other major roads and thoroughfares. The downtown building is situated in the luxury automobile district area of the city, near MercedesBenz, Lexus, BMW and Audi dealerships. “We’re right beside the competitors, and being along the Don Valley Parkway is tremendous exposure for our brands,” LeRoeye said. “The number of cars that drive up and down here every day is very, very large, and brands want to have exposure.